Last week I posted my tips for prepping for Camp NaNoWriMo. If you missed that post, you can check it out here. Camp NaNo actually designed a calendar you can use, which is what I used. You can print your own here. I’m going to be participating in Camp NaNoWriMo next month. 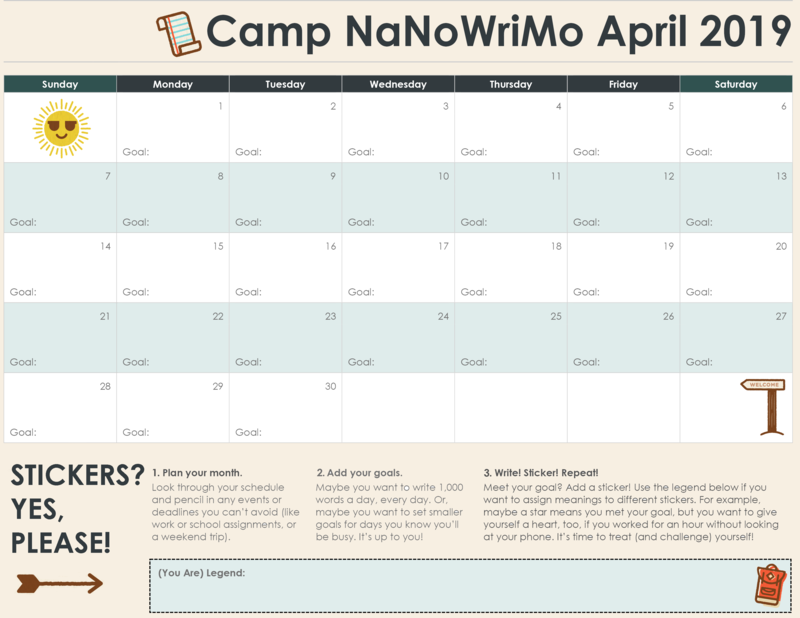 For those who might not know, Camp NaNo is an extension of NaNoWriMo (where you write a novel in 30 days throughout the month of November). There are two sessions of Camp Nano, one in April and one in July. You are sorted into virtual cabins with like-minded writers who support you throughout the month. You can sign up and find out all the details here. The thing I like about Camp Nano is that you can choose to do whatever writing project you would like. Some people work on a series of short works such as poems or short stories, others work on nonfiction pieces, some focus on revising and editing a novel, and still others follow the traditional Nano and write 50k words in a month. I’ve chosen to do a revision project. I pulled out a manuscript I stored away several years ago and am going to see what I can do with it. It’s a nice chance to step away from my current WIP and focus on another project. 1. Decide on your project. What are you going to do? Is there something you need to finish with an impending deadline? Maybe there’s a piece you’ve set aside that you’d like to reexamine. Or maybe you have a series of shorter pieces you want to complete. This is one of the best parts of Camp NaNo – picking what you want to do! 2. Gather your supplies. For me, this included some research materials, which you may also need if your project requires it. I always have a specific notebook assigned to each project I do so my notes are all contained in one place. Maybe there are some specific resources you might need for guidance. (I’ve included a list of resources at the bottom of this post.) You’ll want to have you planner/calendar for the month handy too (more about this in the next tip). And then there are the obvious things you’ll need – pens, laptop, a favorite writing snack and /or drink, and any other essentials you use when you write. 3. Set up your timeline/calendar. You need to decide on a plan. How many pages, hours, words, ect., are you going to write each day? Make little goals and create a reward system for yourself to help keep you motivated. I start with little rewards like a candy bar or a Starbucks drink, and then build up to larger things like a new mug or book. I usually choose a big prize for completing my final goal at the end of the month, something I’m really excited about that will help motivate me to finish. I’m still working on setting my plan up, but when I finish I’ll share what my calendar looks like. 4. Last but not least – Have Fun! Make this a fun event. If it’s something that will be a lot of stress for you right now, maybe decide to try July’s event instead. If now is the right time for you, don’t put too much pressure on yourself. You want to reach your goals, but also be realistic. Don’t set goals that you will be unlikely to attain. And remember this is something you tailor to you – so you can make it as big or as small a project as you’d like. These helped me with my plan for Camp Nano and I hope they’ll help you too. I know some people don’t like NaNo because it’s too much pressure, but this is a more relaxed version since you’re picking the project and the goals. So even if you don’t like NaNo, you could still give Camp NaNo a try. Story Genius by Lisa Cron This is a craft book with tips for creating your novel. Revision and Self-Editing by James Scott Bell. This is a great resource to help with revisions on your novel. Self-Editing for Fiction Writers by Renni Browne and Dave King. This is a great guide on how to self-edit your novel. No Plot? No Problem by Chris Baty. This book is by one of the creators of NaNoWriMo and is an inspiring and quick read. Very helpful if you’re not sure what you’re going to write about. This post is part of the #authortoolboxbloghop. It’s hosted by Raimey Gallant. For more details and to join in the fun, go here. What about you? Are you participating in Camp Nano this April? What do you do to prepare? Let me know in the comments! Feel free to share and Post to Social Media with #nanobingo18. Treat Yourself for working so hard! How many squares have you already completed? Let me know in the comments! Great characters deserve great names, but how do you determine what that name should be? Some writers just write whatever name comes to them. They like the way it sounds, so it should work, right? Not necessarily. There are a few things to consider when naming your characters. First off, you don’t want to have characters with names that sound the same or begin with the same letter. Your readers will inevitably mix them up. I’ve had it happen to me. I’m reading along when I suddenly realize, “Wait- this isn’t that character, this is that other character. How long have I been mixed up?” I furiously flip back through pages I’ve already read, trying to determine where exactly I got confused. It’s not a good feeling, and you don’t want your readers to experience it. Second, you want your characters’ names to match up with their personalities. For instance, if you are naming a scaredy-cat character who never faces his fear, you wouldn’t want to name him Eric, which means “powerful”. A baby naming book is a great tool for finding names for your character. In fact, sometimes it’s fun to peruse a naming book and write down names you like for use in a future story. I like The Name Book by Dorothy Astoria. Third, you want your names to be consistent. (This pertains especially to fantasy and sci-fi.) By this, I mean you don’t want to have a lot of characters with exotic sounding names like Thordan, Boriel, and Cantor, and then have one character named Tom. When a reader comes to that name, they’ll be drawn out of the story just trying to figure out why his name is Tom. The exception to this rule would be if there actually is a specific reason for his name being Tom – like maybe he is from a different place than all your other characters. Fourth, make sure names are believable and not too hard to pronounce. You want to be creative, but you don’t want to turn off readers. Try saying your chosen name out loud. Show the name to some friends and have them read it back to you. If it seems a little too made-up or hard to pronounce, it probably is. Also, if you can’t find the name in a baby book or a online name generator, you should probably nix it. Fifth, minor characters might only be known by characteristic/appearance. Sometimes we have characters so minor they don’t need an actual name, but they do need something shorter than a full description for each time you refer to them. For instance, perhaps there is a mean boy tormenting your MC. He could simply be referred to as Meanie once you’ve introduced him as such. Maybe there is an extremely pale girl who rides the same bus as your MC, but never actually talks to the MC. She could go by Ghost. I recently read a book where the MC’s name was Seredipity. Kind of a cool name, right? At least it was until the author gave the MC the nickname Pity. Yes, Pity! Every time I read the name I couldn’t help but think, “What a horrible name! Are we suppose to pity her? Does she pity herself? Who would want to be called Pity?” I struggled to get through that book. So you get the idea. You want to use creativity in naming characters, but you also want to be sure your characters’ names make sense, and that they don’t turn the reader off. How do you choose your characters’ names? What tips do you use to help you choose names? Let me know in the comments! This post is part of the #AuthorToolboxBlogHop hosted by the lovely Raimey Gallant. To find out more about the blog hop and check out the other participants’ post go here. Comp. Titles: These are books that are comparable to the book you are writing. I write YA fantasy with a fairytale twist (some are retellings, some are just stylized like fairytales), so I read a lot of fantasy, especially retellings. I don’t have a specific list for this group, because I am always on the lookout for these books and am continually adding to my TBR list. This month I have selected several books to read for the #fantasticfeb reading challenge, and several of them fall into this category. You can see my #fantasticfeb list here. Another diyMFA book club prompt was to share a picture of your writing space. I love this desk! I’ve had since I graduated from college. One day, my grandpa (the same grandpa who helped inspire me to become a writer by telling me his stories) and my dad helped me comb through garage sales to find a sturdy desk. We found this one for a dollar. It needed some cleaning, a little sanding, and a new coat of stain, and then it was ready to go. Pretty awesome, right? So how about you -What’s on your reading list? Do you have a favorite craft book? Where do you write? Let me know in the comments. Today I’m responding to a couple more diyMFA book club prompts. Both of these two prompts were particularly interesting to me, because I feel like they given me some insight into my current WIP. First, is which supporting character type is your favorite to write? The fool – This is the character who tells the MC the things he or she needs to hear/face, but won’t face on his or her own. Often this character seems shallow in the beginning of the story, but as the story progresses you see that is not the case. The love interest – This one is pretty self-explanatory. This is the MC’s love interest. Sometimes there can be more than one, creating more conflict in the story. The mentor – This is the character who takes the MC under his/her wing and often tells the MC things he/she wouldn’t otherwise know. The BFF – Again, pretty self-explantory. This is the best friend of the MC. This is another case where having more than one can help create more interest in the story. The villain – This is the person who is out to destroy the MC, and this is my favorite supporting character to write. I love seeing how the villain came to be, and writing at least little of his/her origin story. I also like comparing the MC to the villain – hi-lighting the choices the MC makes that keeps him/her from going down the same path as the villain. When talking about villain stories, I have to mention Heartless by Marissa Meyer. This is an excellent origin story about how the Queen of Hearts came to be. If you haven’t read it, I highly recommend it. The next prompt moves from characters to story. Just like with character types, there are several story types. 1. The protagonist faces a more powerful antagonist. 2. The protagonist faces an antagonist of equal power. 3. The protagonist faces himself. My favorite story type is the first one – the underdog story. I love writing about characters that triumph even when it seems unlikely that they will. Even in real life, I always root for the underdog. Just like with many of things, your story can be a mix of these types. Often the protagonist is going to have to confront him/her self. These scenes are fun to write. I like discovering why characters make certain choices and seeing how those choices are going to change their journey. I’ve really enjoyed participating in the diyMFA book club, and I will be posting about it once more later this week. Though the book club is pretty much over, there are a lot of great resources available on the diyMFA website. And if you’re on Instagram, check out the giveaway I’m hosting @charityrau. The first prompt: What is your storytelling superpower? Disruptor – You’re drawn to larger-than-life characters who rebel against the status quo. Your stories champion people who will do whatever it takes to change their societies, overcome all odds, and defeat tyranny. Whether your character makes a small but significant personal choice or starts an all-out revolution, at the core your stories are about sharing your ideals with the world. I do love to write about characters who overthrow evil tyrants 🙂 , so I think this fits. This quiz is pretty fun, and gives you some insight on why you might be drawn to certain characters. If you want to take the storytelling superpower quiz, you can do so here. The second prompt: What feeds your creativity? I find inspiration in art, nature, family and friends, people watching, books, and movies, to name a few. One thing that I found really helpful in Gabriela’s book is the idea of having an ORACLE (outrageous ridiculously awesome creative literary exercises). An oracle is a box or container filled with things that inspire you. Whenever you’re having an uncreative moment, you go to your ORACLE and look through it. Up until this point, I had just been keeping a notebook with ideas, but I realized how helpful an ORACLE could be. So many times I forget things that have given me a moment of inpiration. So I have decided to start my own ORACLE. I found this box which I think is perfect. I love the color and sparkly mermaids! They fit fit right in with my genre (fairytale/fantasy). The thing I really like about the ORACLE is that it can grow with me. As I find more inspiring things, I can add them into the ORACLE. This is going to be great for my creativity! What’s your storytelling superpower? Do you have an ORACLE? What kind of things do you keep in it? Let me know in the comments.